This Demonstration explores some elevation profiles of the geographical area around the Grand Canyon using data downloaded from the Google Maps Elevation API. Elevation data are generated along 50 lines of longitudes between and West with 50 points each of latitudes between and North. 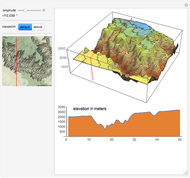 The elevation and location data can be extracted from . 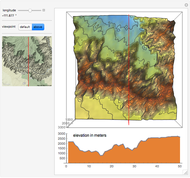 The data for this Demonstration was collected with the URL: "http://maps.google.com/maps/api/elevation/json?sensor=false"<>"&paths="<>"&samples=21"
where "paths=" is a list of 2500 geolocations from a selected area of the Grand Canyon with longitudes between and and latitudes between and . Google Developers. "The Google Elevation API." (Apr 21 2014) developers.google.com/maps/documentation/elevation. Erik Mahieu "Exploring the Grand Canyon"